One of my absolute favorite things to do in the world is to hop into my trusty little SUV and drive west to explore this country’s rugged landscapes and the many gorgeous western National Parks this country has to offer. This past fall I was able to revisit the national park that completely stole my heart: Glacier National Park. I was also a nice enough daughter to invite my very own parents to come along for the adventure and they were more than happy to join me! Having explored numerous regions of the Rocky Mountains over the years, this far northwestern chunk of the range that sits on the US/Canadian border, is hands down (in my humble opinion) the most stunning part of the US Rockies. The pines are tall, the exposed peaks are more rugged and craggy, the alpine lakes are that glacier-fed milky aqua-blue that will make you stare in awe with your mouth open and the wildlife is everywhere. To me, this is the definition of North American wilderness. And yes, there are plenty of grizzlies to see. In fact, we saw one within two minutes of entering the park doing its grizzly bear thing, waddling around, eating berries. We stayed on the eastern end of the park, which I prefer because it’s technically the drier side with less obstructive views of those big majestic mountains. The hilarious thing about that little tidbit was that 80% of the time the eastern side was covered in a dense blanket of clouds that were dumping buckets of freezing rain while the western side was partly sunny and 60 degrees. Glacier National Park is MASSIVE, so experiencing different weather at different regions of the park is the norm. 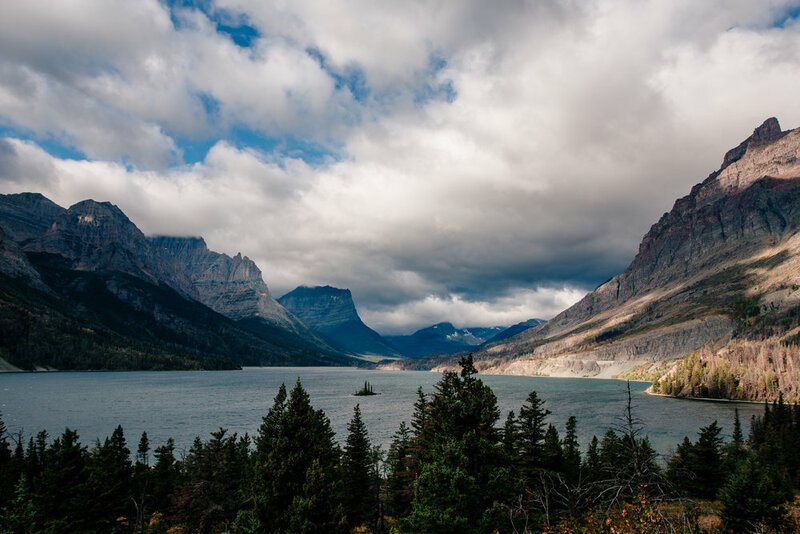 The ever-changing weather made for some awesome dramatic photographic opportunities as well as some very scary drives along the famous Going-to-the-Sun Road, which is the narrow two lane road that takes you through the mountains to get to the western side of the park. 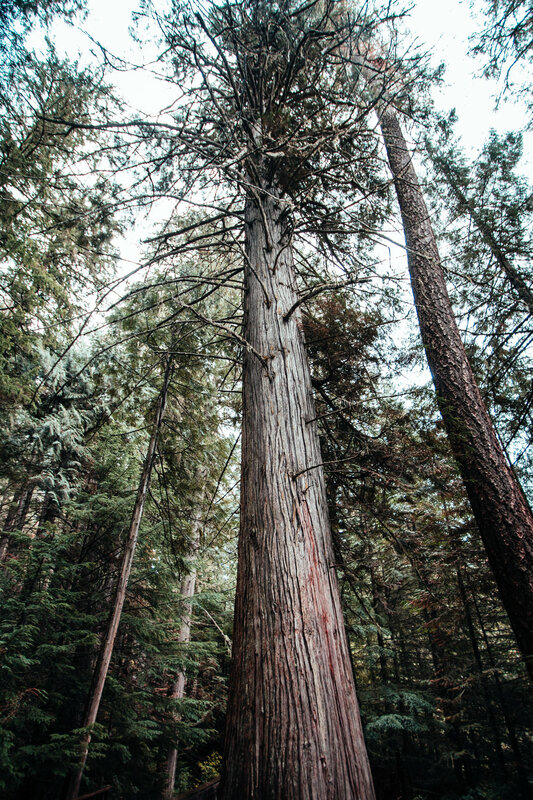 When the weather was exceptionally bad on the eastern side of the park, we’d head to the west side by Lake McDonald where the sun would break through the clouds and explore the dense old growth cedars and waterfalls. Rain or shine, I made sure we got out to the trails to do some hiking. Glacier is a hiker’s paradise. 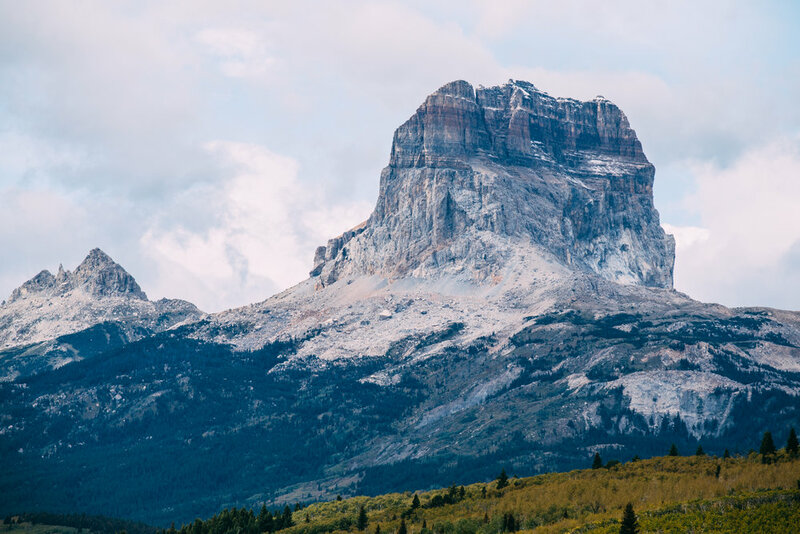 Every hike I’ve done in Glacier has stunning scenery and ends with a grand finale, which could be a bright turquoise alpine lake, dramatic waterfall, or…drumroll…a GLACIER! Side note: although we didn’t get to do this hike this time around, I highly recommend the hike to Grinnell Glacier, that’s my ultimate favorite hike ever. The best region in the park for hiking and breathtaking mountain vistas is Many Glacier, located on the northeastern corner of the park. Knowing my parents aren’t used to high altitude mountain hiking, I picked out some easy-to-moderate hikes for us. We also opted for some hikes that were guided by a ranger and included a boat ride or two to allow us to soak in the views and learn more about the park. Two hikes we did that are great for guided hikes and scenic boat rides are St. Mary Falls and Grinnell Lake. I admit, when I initially realized the crazy weather we’d be experiencing during our time in Glacier, I was a little disappointed. However, I quickly learned that Glacier does not disappoint, EVER. I was so happy to share this place with my parents, and I’m already dying to go back. I will see you again someday, Glacier National Park! This hike is such an adventure. 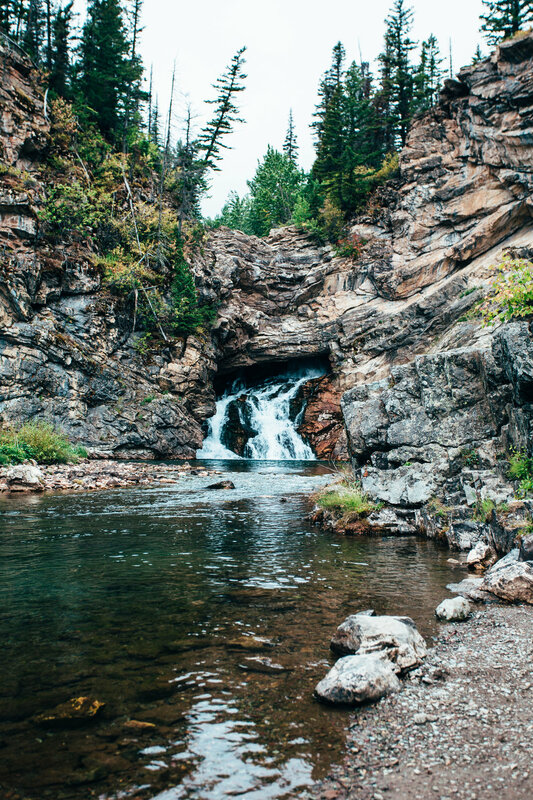 It can be pretty strenuous as you gain nearly 2000ft in elevation, but you get to see absolutely stunning vistas, waterfalls, glacially fed lakes, and wildlife throughout the whole hike. The big reward is being able to get up close and touch (and maybe even walk on) one of the few remaining glaciers in the park. 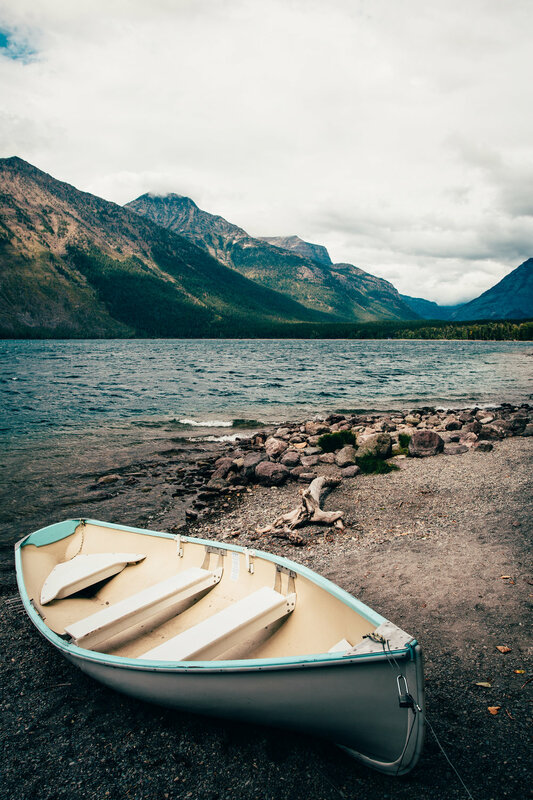 Shave off some of the miles by taking the boat ride across Swiftcurrent and Josephine Lakes and learn all about the geology by doing a ranger led hike! Another fairly easy hike that you can start off with a lovely boat ride across the infamous St. Mary Lake (opening scene of The Shining, anyone?). Wildfires recently burned much of this area, so it’s very interesting to hike through a charred dead forest but also notice the abundant new plant life that’s blossoming on the forest floor, so many colorful wildflowers! You’re hiking along the side of a mountain looking downwards at St. Mary Lake for a chunk of the hike, keep a lookout for moose enjoying a lovely beach day along the shores! The waterfall at the end is pretty, but honestly the hike was my favorite part. This is probably the most popular hike in the park, it’s fairly easy and you get to hike above the treeline with a bunch of marmots and mountain goats on frozen tundra wondering where this hidden lake is hiding and then BAM! You’re staring at one of the most picturesque scenes in the park. At Gitchi, we're grateful to partner with a group of people who love spending time in the outdoors and who also represent our company by doing things like adorning themselves in our products and heading off into the wilderness to shoot photos of their experiences and act as Gitchi ambassadors. We affectionately call these folks "Gitchi Guides." Since early on, we've had the pleasure of working with one Gitchi Guide, Krissy, a gal with a very funny and dry sense of humor, a love of hiking anywhere and everywhere, and an incredible talent for taking nature photos. And if that wasn't enough, it turns out she's also got a knack for writing about her wilderness-filled travels too. It's our pleasure and honor to have Krissy share her travels to Glacier National Park.